Chag Sameach from Israel Bookshop! Enjoy these treats l’kavod Yom Tov! 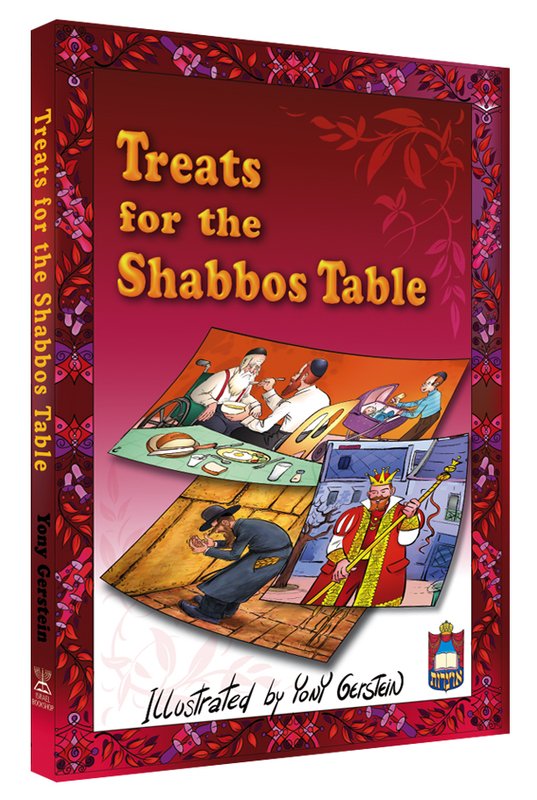 Click here for your free download of Treats for the Shabbos Table on Sukkos. Click here for your free download of Treats for the Shabbos Table on Shabbos Chol Hamoed. Click here for your free download of Treats for the Shabbos Table on Shemini Atzeres and Simchas Torah. Feel free to pass around and share with friends! The new book Treats for the Shabbos Table will be available at your local bookstore right after Sukkos. To purchase online click here. Click here for your free download of Treats for the Shabbos Table on Rosh Hashanah. Click here for your free download of Treats for the Shabbos Table on Parshas Haazinu. K’siva V’chasima Tova and A Gut G’benched Yur from your friends at Israel Bookshop Publications! It is Shabbos, and the entire family is seated around the dining room table. All are partaking in Ima’s delicious cholent, and for a few moments there is a lull in the conversation. Then Abba takes one last bite and reaches for the book at his side. The above scenario has, in all likelihood, occurred in many a frum home in Eretz Yisrael throughout the past few years, and now, will hopefully begin occurring in frum homes all over the world, as well. Because while up until now, Treats for the Shabbos Table has only been available in Eretz Yisrael, beginning with Sefer Bereishis, we at Israel Bookshop will iy”H be distributing it worldwide, thus making it available to anyone and everyone out there! What is Treats for the Shabbos Table? you may wonder. Treats for the Shabbos Table began as weekly sheets on the parshah, which contained a dvar Torah pertaining to each week’s parshah, in addition to clever illustrations by popular artist Yony Gerstein. The dvar Torah was always family-oriented as it was kid-friendly, making it the perfect material around which to center family Shabbos table discussions. As the weeks and months went by, these dvar Torah sheets were eventually collected and published as a full-fledged book. Now, on any given week, no matter what the parshah, Treats for the Shabbos Table fans had what to read from and discuss around the Shabbos table. Yet, as mentioned before, for years this “treat” was only available to the Israeli public. Now, however, all that has changed, and very soon, YOU, TOO, CAN PARTAKE IN THIS DELECTABLE SHABBOS “TREAT,” no matter if you live in America, England, or South Africa! For the next few weeks, we will be making a Treats for the Shabbos Table dvar Torah available for downloading, so you can see for yourself how appealing each one is. Be sure to check us out each week… This is not something you want to miss out on! Click here for Parshas Nitzavim-Vayelech. Yes, you’re right; we haven’t been posting too many new things on our blog lately—but not because we’ve been sleeping on the job! While so many others have been out vacationing, relaxing by the pool, and taking fun family trips, we’ve been working hard to prepare a new season’s worth of books for you. And now that the summer is coming to a close, we’re just about ready to release all our latests and greatests and start the new year off with a bang! So, you ask, what’s new on our menu? Well, to take that question literally for a moment, we actually have lots of fabulous fresh food ideas and recipes up our sleeves—all from our newest cookbook, The At-Home Gourmet, by Sarah Lasry, author of the bestselling The Dairy Gourmet. Sure to become a winner like The Dairy Gourmet itself, The At-Home Gourmet will tease your taste buds to no end, until you actually go out, buy yourself a copy of it, and try out those recipes on your own, for a spectacular Yom Tov seudah or for any other occasion! Then, for all you readers who like nothing better than a good medical drama, we have a brand new one in the wings. Struggle to the Summit is the inspirational story of a young wife and mother on the long and arduous road to recovery after an extremely dangerous and delicate neurological surgery. Of course, Elul being Elul, what better time is there to work on our middos and service of Hashem than now? And Israel Bookshop has the sefarim you’ll need for that, too. If you’re a parent or educator, you’ll love our chinuch sefer, Cornerstone of Chinuch, written by prominent mechanech and long-time Head-teacher (principal) of the largest Chareidi elementary school in England, Rabbi Yonoson Yodaiken. Based on ten distinct, tried-and-true strategies, the book focuses on how to instill good middos in our children. You already read and enjoyed an excerpt from Cornerstone of Chinuch in our summer edition of The Next Page magazine; now you can look forward to having the full pleasure of reading the book in its entirety. Any avid reader is, more likely than not, familiar with the popular Torah Tavlin series. Now, just in time for Parshas Bereishis, Torah Tavlin Vol. 2 is ready to be released! Sure to add lots of “spice” and enjoyment to your weekly review of the parshah, this latest Torah Tavlin book will be a welcome addition to your bookshelf. And once on the subject of “Volume 2,” here’s another one of those coming soon: A Time to Laugh, A Time to Listen, Volume 2, by Rabbi Yehoshua Kurland. Readers loved Rabbi Kurland’s way of combining humor with fundamental hashkafah lessons in A Time to Laugh, A Time to Listen Vol. 1, and now you’ll be able to enjoy more of that with his newest book! She couldn’t understand what was happening to her. She had just given birth to a healthy baby, and everything was doing great. She had so much to be grateful for, so much to be happy about—so why was she feeling the exact opposite of grateful and happy? 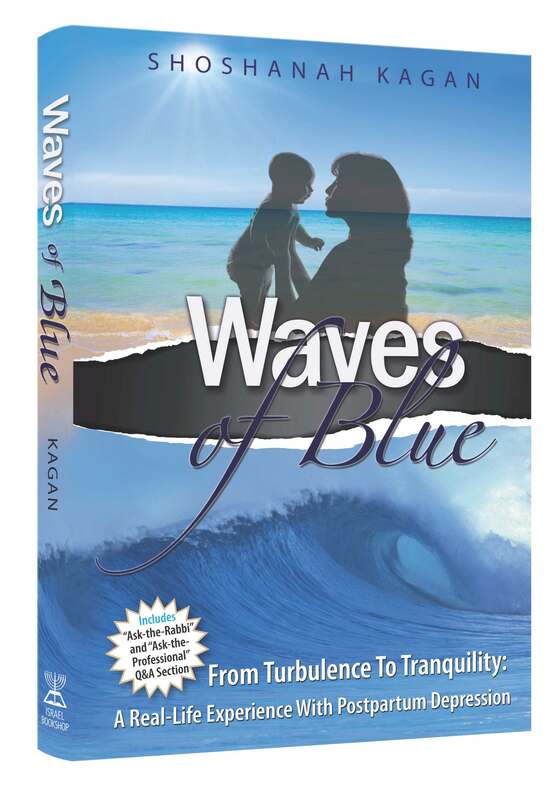 Coming next week, Shoshanah Kagan’s book, Waves of Blue, is sure to fill a very essential role in our community. Postpartum Depression is a serious condition, and one which can affect any new mother. It is not “just another case of ‘Baby Blues’,” and it is certainly not something to be swept under the rug and left untreated, whether due to fear or lack of knowledge. That is why we expect Waves of Blue, which honestly and accurately chronicles one woman’s experience with PPD, to make such an impact on the frum community. Shoshanah was your typical frum young wife and mother when she began experiencing the terrifying symptoms of PPD. At first she was in denial of them; then the guilt and shame kicked in. But once she and her husband learned to accept her condition and work with it, she knew she had taken the first step towards the road to blessed recovery. And recover she did! As you read this eye-opening book, you will find yourself connecting to Shoshanah, as she rides the waves of a journey she did not ever intend or want to be on—but was to eventually see the good in, as she grew from the experience. You will relate to her, cry with her, and—most importantly—learn and grow with her from her experience. — Rabbi Abraham J. Twerski, M.D. Rafi Zimmer, neglected child of a dysfunctional family, is at his lowest ebb. Nava Cohen, a high school teenager, is feeling stifled and choked by her relationship with her parents. And Ronny Gelbart is looking for just one thing—a way to get even with the chareidim in his neighborhood. What happens when Ronny, on the warpath, searching for revenge, decides to make use of the insidious weapon called blackmail? Can Rafi ever escape his past and put his horrible background behind him—or will he forever be entangled in Ronny’s tight clutches? And is it possible for Nava’s eyes to be opened to the bright rays of the sun in her life—or will she always remain blind to them? Great news for all of you Halachically Speaking fans out there! Just in time for Shavuos, Halachically Speaking 2 is now in its printing stage and about to hit the bookstores! Personally, I found Halachically Speaking to be an incredible sefer. It is extremely reader-friendly and easy to understand, and is chock-full of all those halachos that you heard about once upon a time, but then didn’t hear about again, and then sort of forgot about altogether… All the shoe-related halachos, such as sleeping with shoes on; putting in shoelaces on Shabbos; wearing the shoes of a deceased person; and removing your shoes for duchaning (if you’re a kohen)… Halachos relating to inyanei derech eretz, such as leaving over some food on your plate; not drinking from a cup in one shot; and not eating in the street… All the potato-related halachos you could think of, such as the brachah to recite on Pringles, instant mashed potatoes, and potato knishes; the status of a hot potato when it comes to Bishul (Cooking) on Shabbos; potatoes on Pesach; and bishul akum regarding potatoes… The halachos of washing netilas yadayim in the bathroom, like when you’re on an airplane; the halachos regarding when to say and when not to say a brachah on water… and this is only a sampling of some of the topics covered in this book! 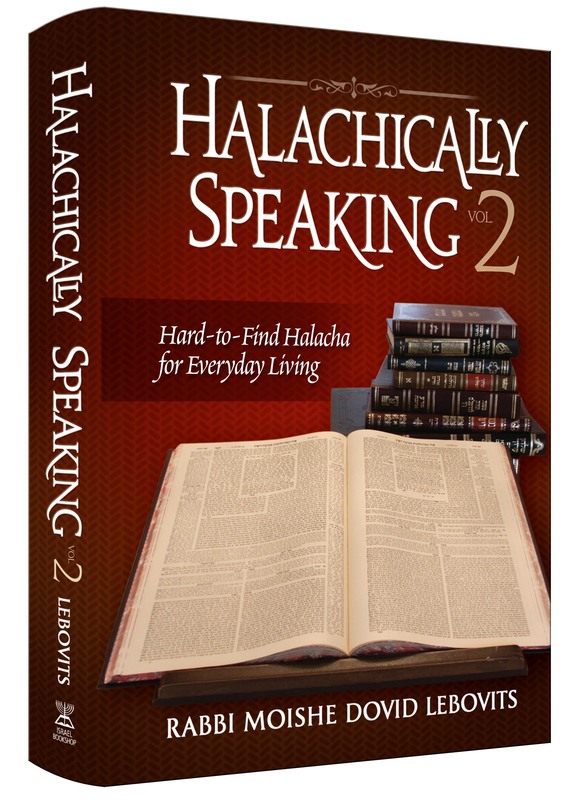 And, like I said, Halachically Speaking 2 will be in the bookstores in time for Shavuos, the day of Kabbalas HaTorah. Well, folks, what better way to show our dedication to the Torah than by studying the “manual” to it—namely, halachah? So, as you run to the grocery store to pick up another few tubs of cream cheese for your cheesecake, and stock up on jars of Nescafe coffee for your Shavuos all-nighter, and stand for hours at your local Shop-Rite’s floral stand, trying to pick out the nicest bouquet for Shavuos (and of course for your wife! )—don’t forget to make a stop at your local bookstore, too, to pick up your very own copy of Halachically Speaking 2. Trust me—you’ll be glad you did.